The ruling Christian Democrats have won the largest share of votes in the Dutch election, but now face a difficult task in forming a coalition government. Prime Minister Jan Peter Balkenende's CDA party won 41 seats in the 150-strong parliament. The opposition Labour Party secured 32 seats, while the Party for Animals became the first animal rights party to win seats in a European parliament. The Socialists made the biggest gains, taking third place with 26 seats. The coalition negotiations - that have already begun - could be lengthy, as neither the right nor left blocs won the 76 seats needed to control the lower house of the parliament. 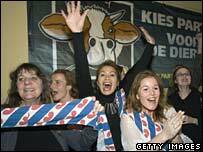 The Dutch were split between parties tough on immigration and pro-business, and left-leaning parties with a softer approach. The CDA's current coalition partners, the Liberals (VVD), won 22 seats, meaning the CDA will need to include several more parties to reach a working majority. Despite securing fewer seats than they previously held, CDA members have been celebrating the result. "We are the biggest party again... the effort of four years of struggle has been rewarded and that makes me proud, " Mr Balkenende told supporters. "It is a fantastic result because in March in the local elections we won just 28 or 29 seats, so 41 is a great achievement," CDA MP Coskun Coruz told the BBC. The BBC's Sam Wilson in The Hague says that the celebratory mood at the CDA's party headquarters was in stark contrast to the atmosphere at the Labour Party's offices, where many are unhappy at the loss of many seats to the Socialists. "We expected to double our seats but this is absolutely fantastic. I am proud the Netherlands wants to move left," said Socialist Party MP Agnes Kant. The other big winner was the anti-immigration Party for Freedom, PVV, led by Geert Wilders, which took nine seats. The Christian Union won six seats and the Green Left party seven. "It's chaos. It is extremely difficult to distil a government out of these results," said Finance Minister Gerrit Zalm from the VVD. "The jigsaw can still be laid in many different ways," said a Labour candidate, Nebahat Albayrak. The CDA-led governing coalition collapsed in June after a row over its handling of the disputed citizenship of a Somali-born Dutch politician. The turnout was just over 80%. The MPs are elected for a four-year period by proportional representation. In a live TV debate on the eve of the election, the party leaders focused mainly on welfare reforms rather than immigration. The immigration issue had gripped Dutch politics since the high-profile murders of two prominent campaigners against Muslim extremism - independent politician Pim Fortuyn and film-maker Theo van Gogh. On Friday, the cabinet backed a proposal to ban face-covering clothing, including the burqa worn by some Muslim women. The main parties have both embraced pro-integration policies - a departure from the Dutch tradition of multiculturalism. Mr Balkenende has also been claiming credit for a strong economic recovery in the country in the past few years.